Daniel “Emmett” Martin, 60, of Fountain and formerly of Beaver Island, died Friday, Nov. 23 surrounded by his family. He was born on Beaver Island Oct. 6, 1947 to the late Marion and Charles Martin. 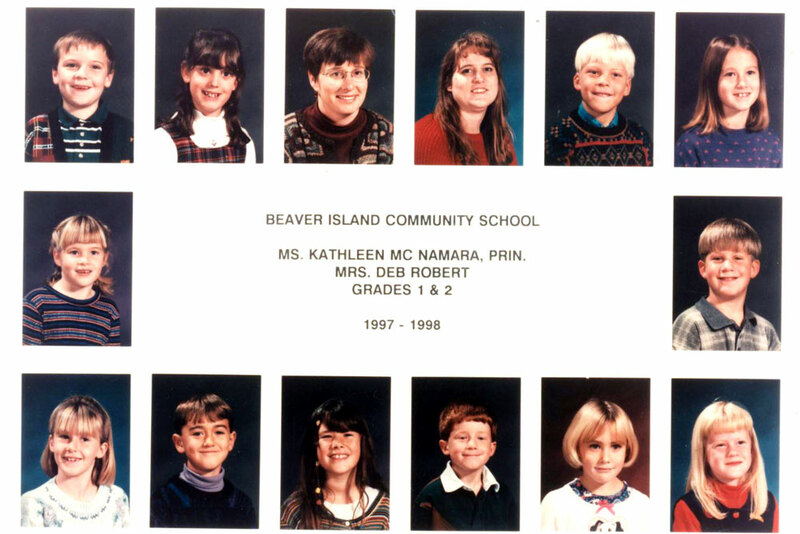 Emmett was taught by the Catholic nuns as he attended school on the island. 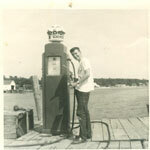 Emmett worked many years as a commercial fisherman and general contractor. 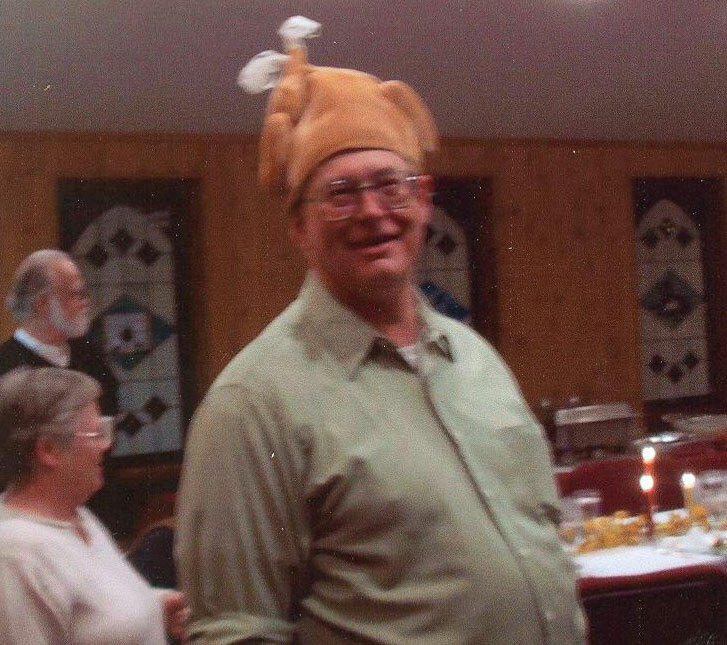 He enjoyed hunting, fishing, spending time with his grandchildren and going on road trips. Emmett was Irish, Catholic, and a man with a plan. He had a sense of adventure. Emmett is survived by his love of 34 years, Nancy McDiarmid of Fountain; their daughter, Julie Martin; grandchildren, Jacob Emmett, Brennan, Levi and Evan Daniel Martin of Walhalla; stepdaughters, Jill Schwartz of Fountain and Jody Yerian of Evart; stepgrandchildren, Joshua Schwartz of Tennessee, Shawna Schwartz of Virginia, Mariah and Devin Schwartz of Fountain, Noah and Jonah Yerian of Evart. He is also survived by two brothers, Buddy Martin of Beaver Island and Mike Martin of Sparta; three sisters, Margie Armstrong of Beaver Island, Sally Delia of Hesperia and Mary Jane Martin; several nieces and nephews. Emmett was preceded in death by his brothers, Jimmy Lee Martin, Erwin Martin and twin brother, Ernie Martin. The wake will be held at 7 p.m. Friday, Nov. 30 at the Martin house on the island. Funeral Mass is at 11 a.m. Saturday, Dec. 1 at Holy Cross Catholic Church of Beaver Island. Memorial contributions may be made to the family. Emmett Martin will be coming home on the boat on Friday. Wake will be held at Jacqueline Martin's home. Rosary at 7:00 p.m. Friday, November 30th . Funeral Mass at Holy Cross Church on Saturday, December 1st at 11:00 a.m. The Island Treasures Resale Shop provides fundraising for the Beaver Island Volunteer Fire Department. The Island Treasures Resale Shop is looking for volunteers for the summer months. To run the Resale Shop efficiently, we need a minimum of 4 volunteers for each day that we are open, 5 or 6 each day would be even better. For the summer our hours will be the same as now. 12:00 pm to 4:00 pm. If you are interested in volunteering, either call me, Carol LaFreniere at 448-2308 or Donna Stambaugh at 448-2797, you can also call the shop on Monday's or Tuesday's when we are open from 12:00 until 4:00 at 448-2534. The amount of days per week that we will be open in the summer will depend upon how many people who are willing to volunteer. What a wonderful time for families to get together. With family members home and turkeys in the oven, most Islanders who stayed on the Island , instead of traveling elsewhere, hunkered down and enjoyed a peaceful and relaxing family Thanksgiving. Some watched football and were happy with the results while others were sad that their team had not won. Thoughts of well-wishing for traveling friends and neighbors were brought up, and everyone sat down to a table much too full of food for those present to eat. Prayers of thanksgiving were spoken and wonderful meals accompanied wonderful conversation. The Ecumenical Service at Holy Cross Hall was held at 10 p.m. with about fifty people in attendance. The socializing continued well into the night with some attendees still at the church until 11 p.m., well after the kitchen was cleaned up and the workers had gone home. There was one award given out for the “ Turkey of the Day,” actually for carving the turkeys for many years for this dinner. It was a turkey crown. The 'News cameras were not present to capture this event, but a picture of the crown is shown here. 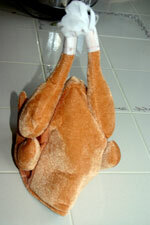 This almost looks like a roasted turkey. The dinner was ready, again this year, by a few minutes before six o'clock in the evening with everyone getting plenty to eat. As usual, there were plenty of people to help out with the setup, the actual preparation of the meal, the delivery of the meal, and the cleanup. Many thanks go out to Ruth Gregg who seems to just keep going like the “Energizer Bunny.” Perhaps that's an idea for a crown for next year. The turkey who was crowned. Thanks to Paul Niehaus for this picture. School was closed on November 27, 2007, at approximately lunch time, due to power outage caused by downed trees and downed power lines on the Donegal Bay Road. The BI Fire Department was kept on alert for downed lines. Great Lakes Energy workers worked late into the night on November 27, 2007, and began early on the 28th to restore power to all on Beaver Island. The Island weather was not so terrific for those wanted to leave to go home on Saturday, November 24, 2007. Although airplanes could be heard on and off throughout the day, the Beaver Island Boat Company's Emerald Isle went out, but had to turn around and come back to Beaver Island due to the strong southwest winds. The temperature was hanging on just around the freezing point so that the precipitation was in the form of snow, but the ground temperature made the snow into slippery slush. Cold and wet and windy were the words used by most to describe this Saturday of Thanksgiving weekend. For the second day in a row, November 25, 2007, there were gale warnings on the big lake. The unfortunate visitors who hoped to go on the boat today are simply out of luck. If they plan to leave the Island today, they better have made reservations with one of the flying services, either Island Airways or Fresh Air Aviation. They airlines serving Beaver Island will have quite a profitable day transporting the Thanksgiving visitors to and from the Island as well as those that just need to go to medical and other appointments. The windy weather did not stop two avid golfers from playing nine holes of golf with the temperature at 38 degrees and a gale force wind. Buck and Joe, is there any weather you won't play golf in? As this is written, the wind is steady at 27 miles per hour and gusting to forty plus with an air temperature of 41 degrees at almost 9 p.m. on November 25, 2007. This morning, November 26, 2007, the winds are down to 3 mph out of the west with a temperature of 37 degrees. This should be much more conducive to boat travel for those stuck on the Island due to weather over the Thanksgiving weekend. A phone call to the Boat Company verified that the boat is going this morning. 2.) we have had less ice cover in the winter. During the winter, the Lake is receiving a relatively small amount of water yet evaporation is still taking place. This is why annual water levels of the Great Lakes naturally reach their lows in the late winter and highs in July. If we had the ice cover that we had in the past, then we lose much less water to the atmosphere during the winter months. The current trend in water levels is causing such great concern that the International Joint Commission has designated a panel (a good friend of mine is serving on the panel) to look into the reasons for the low levels. At this point the biggest culprit is global warming causing warmer winters (i.e. less ice cover especially in the southern basin) and a more severe hydrologic cycle (i.e. droughts but still having severe storm events with 3+ inches of precipitation all at once). However, a recent study has also pointed toward dredging of the St. Clair river in the 1960s. We are loosing more water via the river now because of erosion taking place after that dredging. The newest evidence suggests that while this had a large impact on the levels in the past, it cannot account for the declines that we are currently experiencing. The water levels will eventually come back up because of the natural fluctuations of the Great Lakes , but the long term average will likely continue to decline. Just when you thought the water couldn't go any lower, the wind made it lower. During the first weekend in June your Beaver Island Chamber of Commerce and the Wildlife Club are going to host a visit by members of the Michigan Outdoor Writers Association (MOWA). This is a very important opportunity for the Beaver Island community. These writers, perhaps 100 or more, will publish Beaver Island stories over the next couple of years. The island marketing value, if purchased as advertising, will likely exceed $100,000. Your Chamber of Commerce and some member businesses will subsidize the price the writers will pay to visit the island for their June conference. Additional Chamber marketing expenditures will focus on enticing members to come to Beaver Island . Our goal is to get as many MOWA members as possible to attend our meeting. I will attend MOWA's February meeting in Baldwin and have an opportunity to talk to the group about the Beaver Island experience. The Wildlife Club will plan and guide a variety of island experiences for the writers to enjoy. The MOWA group is not all “hooks and bullets” as they say in the business. In addition to hunting and fishing members are also interested in a wide variety of outdoor and travel related activities. Wild flowers and kayaking as well whitetails and walleyes will be featured for these influential visitors. This is the best Beaver Island market opportunity we have developed in the over seven years I have served. We didn't just get lucky my friends. This is the result of your financial commitment to the Chamber of Commerce. Get you membership renewal in today. Invite a friend to join our chamber. Individual Supporting Members are welcome. Join our partner the Beaver Island Wildlife Club. Thanks for supporting YOUR Chamber of Commerce. 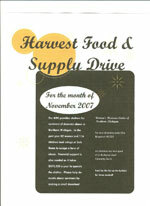 Here is a convenient link to the 2008 Membership form. http://www.beaverisland.org/2008-membership/index.html Also included is a brief summary of how your dues are spent. Save your Chamber some postage. Print the forms and renew your membership today. Thanks for your consideration. No one has been able to locate the framed newspaper article or provide any ideas related to its storage location. The person who had the appendectomy on the kitchen table and who spent a full year in bed with an infection of his abdominal lining, peritonitis, was Omer McCann, as told to me by his wife Marjorie. This and many other stories were told during a chance meeting. It would be great to find that framed article and once again post it, perhaps in the Mormon Print Shop as a historically significant event. Jerry LaFreniere thought that this might have been his father, but, although the operation happened at that location, it happened several years earlier when the store was run by the McCanns. Who is in this picture? This is a summer visitor to the Island just a few years ago. This could be a challenge for the older Islander. Kathleen Green Dvorak sent in the logical identity of Gary Huard since this was taken many years ago, but this is not him. According to the picture label on the back, "To my gal, Phyllis, Clyde Neil Pischner." 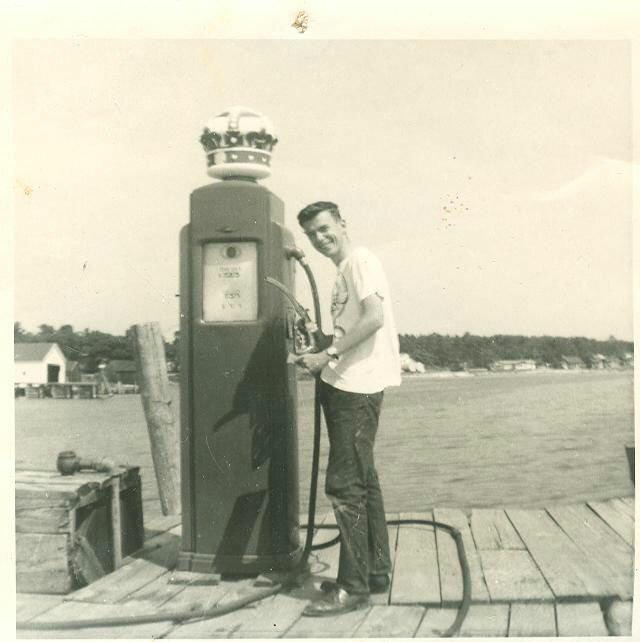 This picture was taken on James' dock in 1966. Why was the now-traditional dinner on Thanksgiving at the Beaver Island Christian Church started? The last scheduled Emerald Isle run is December 14th, the Beaver Islander will finish the last week of our regularly scheduled runs. The Emerald Isle will be going to dry dock for it's 5-year inspection. Please remember this when scheduling vehicles and ordering freight. Sorry for any inconvenience this may cause. Thank you! The AMVETS and Ladies Auxiliary will again host a Santa's Workshop at the Beaver Island Community School on Thursday, December 13 , to enable the kids to purchase affordably priced gifts for their families and friends. Older students and adults will be available to help the youngsters select and wrap their purchases. Notices will be sent home from school as a reminder of this great event. Also, the Emerald Isle Motel, and the AMVETS and Ladies Auxiliary of Post #46 will again partner in the Annual Children's Christmas Party to be held on Saturday, December 15, 11:00 – 1:00 at the Emerald Isle Motel. Hot dogs, chips, cookies, ice cream and beverage will be served to the kids as well as their parents at no charge. Santa and Mrs. Claus will be there to hear the Christmas wish lists and pass out gifts to the kids. Pictures will be taken of each child with Santa and given to them with our Happy Holiday wishes. We wish you all a HAPPY & SAFE HOLIDAY SEASON!! The Women's Resource Center is requesting donations of food and other household items. These items are in a list on a separate page. Click the link that is below the picture. These items may be dropped off at the Christian Church. Click here for a list of items needed for this great cause. The term "thanksliving" was presented last year at the Ecumenical service held at Holy Cross on Thanksgiving morning. This term was presented to the community by the pastor of the BI Christian Church.